Do Some Damage: Redemption or Revenge? In the wake of yet another terrorist attack, there are some predictable responses. Before the police have even disclosed the identities of the terrorists fingers start pointing at Islam, and politicians distort what information there is to support their agendas. That's not what I want to focus on, though. I want to focus more on outcome motivations. Why is it that in the wake of horror the primary response seems to be to assign blame and want revenge? Why is there so little talk about redemption? Is it possible that people really think that it isn't possible? A long time ago, I had the opportunity to work on a history project. That might not sound exciting to some, but I found it fascinating. It recounted how a Christian organization was founded after World War II. I wasn't aware that in Britain, one of the strategies after the war was to promote travel and education opportunities for German youth. As I was told, the government looked for any organizations willing to provide food and housing and some basic civics instruction; money was provided to host these young people, and that's how this Christian organization began. A British major who fought in World War II used that funding to participate in a national program targeting German youth. The purpose? Britain understood that the German youth had been conditioned. Hitler's German Youth programs had been operating for years, and while defeat in the war may have disrupted the actions of the Nazis, it did little to change the thinking of the young people who would rebuild Germany. Would Germany rise up from the ashes of World War II and be a catalyst for another world war, the way they had from World War I, or would Germany follow a different path? I've found little information about this program online. I worked for the organization in question, which went on to become an international organization. 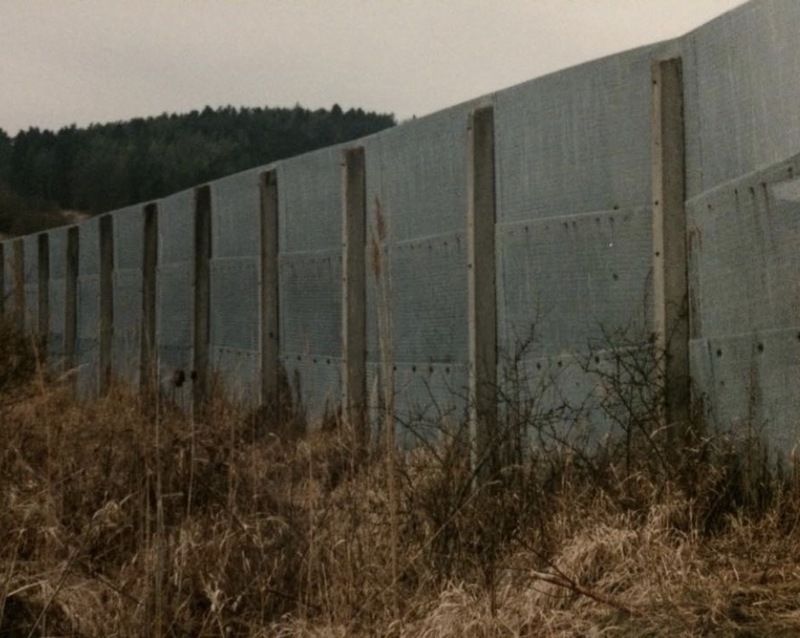 I was a student at one of their schools in Europe in 1989, when the Iron Curtain collapsed and the Berlin Wall fell. 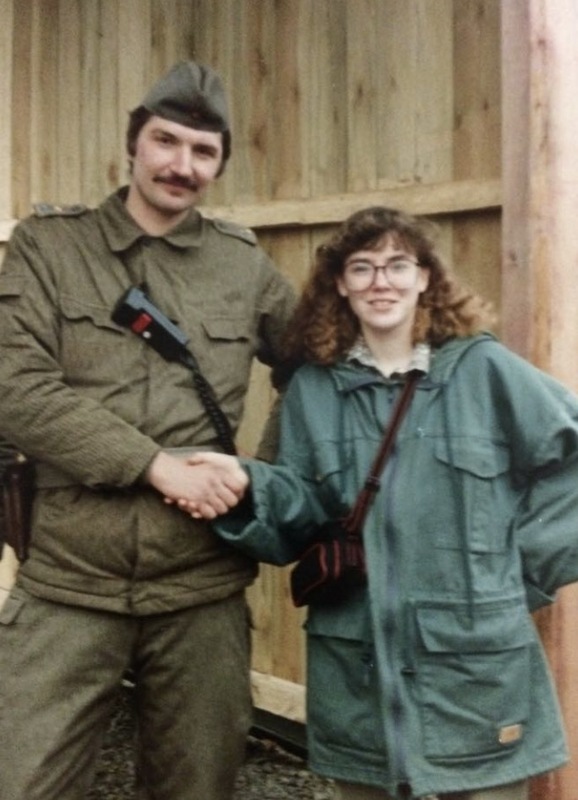 Myself and an East German border guard in 1990. I learned a lot that year through my travels. 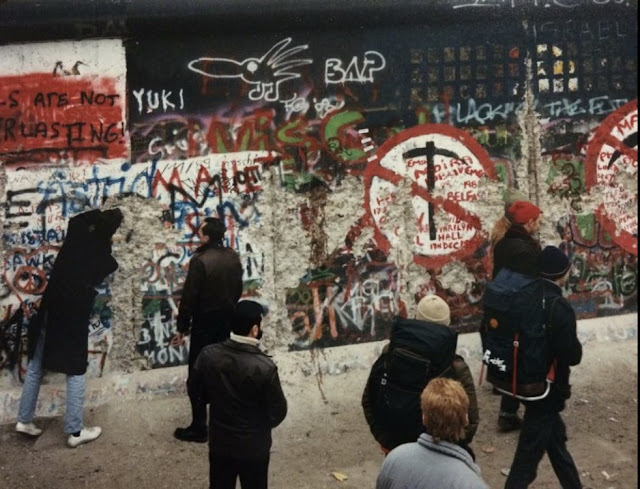 I had the opportunity to see the Berlin Wall being cut apart, while I still passed through the border into East Germany and walked the streets of East Berlin. It was a time filled with tension and optimism. I had this great teacher at school who taught the history of the Old Testament, and he'd talk politics. While it may have bored others to tears, I found it fascinating. He was aware that, in the wake of the changing political situation at the time, nations like France were eyeing Germany with some concern. My experiences traveling had shown me that the German people, however, seemed largely hopeful. They welcomed East Germans; for them, it almost seemed to be part of a national healing process to put their country back together. I had a Germany roommate, and I learned a few things from her. One of those things was that her family went to a Germany concentration camp every year as a reminder about what happened. From what I understood, the practice was common among German families. They did not dismantle the camps and build playgrounds or a residential complexes in their place. I went to Bergen Belsen, and Dachau myself. Later, I spent time in Ireland, and what I experienced there didn't center on hope for unity. Unlike the train stations in Europe where I spent a number of hours, the train station in Dublin cleared within minutes after we disembarked. I loitered, waiting to be picked up and unaware of train station policy due to the perpetual terror threats that existed then. Terrorism never even occurred to me, but I was questioned by police as a result. Fortunately, they realized I was a naive Canadian and redirected me to where I could wait safely, although they kept an eye on me until I left. That was really, for me, my first experience of living with terrorism. I had to travel back to France briefly, and the organization I was working with was in fear of letting me leave alone. At that point, I'd traveled to more than a dozen countries on my own and I felt comfortable traveling; what I hadn't come to fully appreciate yet was that nowhere I'd traveled to that point was more dangerous, and that during my time there a constant threat of terrorism would exist. The military presence and the way the situation in Ireland in 1990 impacted the day to day lives of people stood out by stark comparison to every place I'd been to in my travels to that point, East Germany included. Snipers were positioned near border crossings. I suppose it didn't help that my travels across the border to Northern Ireland coincided with an even for the royal family. Any vehicles driving next to a military vehicle had a gun pointed at them. Lately, I've thought a lot about that history document that I worked on for that organization decades ago. Although there seems to be limited information about it and little credit assigned, I wonder how much the actions of embracing German youth in the late 1940s helped prevent another world war. 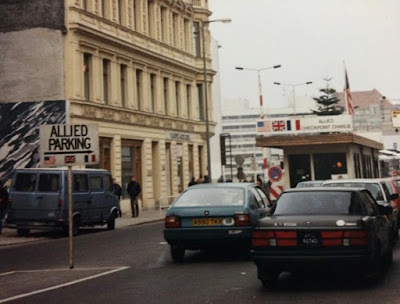 In the wake of 9/11, I traveled to North Africa. I remember an elderly man coming up to me in the market and clasping my hand and thanking me, in broken English, for still coming to their country. As I've been thinking about this, I realize that so much of what I read and write focuses on justice. It focuses on getting the bad guy and, in some cases, making him pay. It focuses on restoring order, but that order is limited by enforcement. 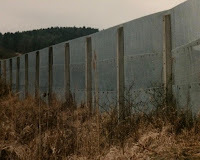 It isn't a complete restoration, because the threats usually still exist; they're simply obstructed by bars and walls. What I don't see a lot of people writing about is redemption. Maybe that doesn't make for exciting stories. Maybe we're so jaded most of us don't believe in it. I don't know. What I do know is that the foundation of my views about foreign policy regarding refugees and actually trying to prevent terrorism find their roots in the origins that Christian organization, all those decades ago. By welcoming the Germany youth, the British taught them that they were forgiven. They were welcomed. They were accepted. They were not shunned. Forgiveness is a part of what enables people to redeem themselves. People could have held on to hate and blame. I'm sure some did, but on a national level the United Kingdom did not. Do you know why there are laws that support children being removed from their family when they witness and experience physical violence? Because children who grow up being abused or witnessing abuse are more likely to become abusers. Do you know that some of the primary factors that make people susceptible to becoming human trafficking victims include war, poverty and lack of education? Consider the Nigerian schoolgirls kidnapped by Boko Haram a few years ago; Islamic militants stole girls that they then declared they would sell into marriage, enabling them to build their population base with children conditioned to follow their beliefs. For the child living on the street, who has lost their family to war, if we won't take them in how likely do you think it is that they'll be given shelter by terrorists, who can distort the truth and train them to hate and to act on that hate? I'm finding it funny that my personal beliefs lean so strongly towards redemption, when my primary entertainment seems to center more on justice and punishment. I wonder if those who haven't had similar traveling experiences or exposures might never consider that modeling the change you wish to see in the world is how you can see it manifested. Maybe for some it's easier to hate. And in the spirit of self-fulfilling prophecy, by perpetuating that hate, those people help perpetuate more violence instead of finding ways to stem the tide. Maybe today, it would be nice to read something that ended on a hopeful note. I'm taking recommendations in the comments. Tell a great story that touches on the heart of darkness and still leave the reader feeling hopeful at the end? There should be a prize for accomplishing that.